…Roy Thomas and Bill Schelly will both be Guests of Honor at this summer’s Comic-Con International: San Diego in connection with their “50th Anniversary of Comics Fandom” theme. Other special guests will be Richard and Pat Lupoff, Richard Kyle and Maggie Thompson, all of whom were responsible for the founding and growth of comics fandom in its infancy in the early 1960s. Without them, I’m pretty sure we wouldn’t be publishing comics mags today. Glad to see Comic-Con’s going to honor these fine folks! This entry was posted in TNT on 25 February 2011 by Mr. Morrow. ALTER EGO: CENTENNIAL (a.k.a. Alter Ego #100) is at the printer, and it’s a whopper! It clocks in at 160 pages (twice a normal issue), in trade paperback format for this one issue, with a lengthy color section. It celebrates not only Roy’s 100 issues of the current incarnation of A/E, but the 50-year anniversary of ALTER EGO’s founding by Roy and Jerry Bails, in the early days of 1960s comics fandom. 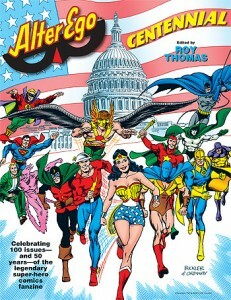 I’m proud to have been publishing the original, legendary super-hero fanzine all these years, and this special anniversary edition features Jim Amash interviewing Roy Thomas about his work at DC Comics in the 1980s (with LOTS of behind the scenes stuff I’ve never heard Roy discuss before). There’s also Alter Ego staples Mr. Monster’s Comic Crypt, Fawcett Collectors of America (FCA), and lots, lots more, so check out the free preview I just posted, and look for it on sale on March 16. This entry was posted in TNT on 23 February 2011 by Mr. Morrow. 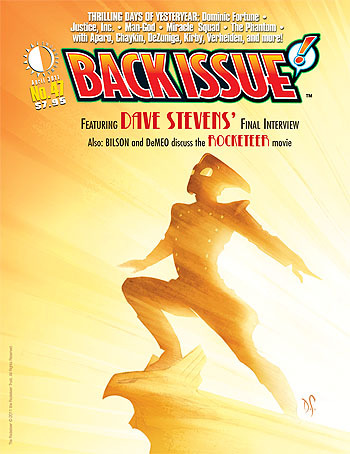 BACK ISSUE #47 features the FINAL IN-DEPTH INTERVIEW with our friend, the late, great DAVE STEVENS, creator of the Rocketeer. Dave died from hairy cell leukemia complications on March 11, 2008 at the way too young age of 52. While we’re still feeling his loss three years later, Dave’s friend Kelvin Mao conducted an in-depth discussion with Dave just over a year before his death, and it’ll finally see print on March 9. You can download a FREE PDF PREVIEW of the issue HERE. You can preorder the PRINT or DIGITAL EDITION (or see a Flash preview) at THIS LINK. BACK ISSUE #47 will be on sale in comic book stores on Wednesday, March 9. This entry was posted in TNT on 15 February 2011 by Mr. Morrow. 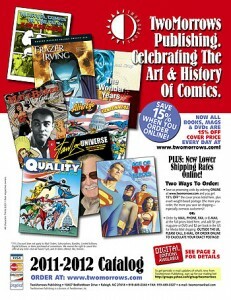 Our 2011 catalog: IT’S ALIIIIVEEEE! Our new 2011 Catalog is finally done, it’s groovy, and it’s interactive! Just click on any item, and you’ll automatically be taken to the ordering page for that item at our website. The catalog is available for immediate downloading at THIS LINK! And we’ll begin automatically including a printed copy with every order we ship directly to customers, as soon as we get them from the printer in early March. But don’t hesitate to download the Digital version now. I think you’ll find it’s a really handy way to search through our stuff. This entry was posted in TNT on 10 February 2011 by Mr. Morrow. We recently added a new category to our website called IN PREVIEWS NOW. Go ahead, click that link, and you’ll see what I’m talking about. It simply lists all the TwoMorrows items that are in the latest issue of Diamond’s PREVIEWS catalog (which you use to order our stuff from your local comics shop). We’ll be keeping that updated, and sending out a notice each month to our Yahoo mailing list (which, if you haven’t joined yet, you really should if you want to keep up with all we’ve got going on these days). So whether you order from your local comics shop, or directly from us, it’s a simple way to keep tabs on what we’ll be shipping in the next 3-4 months or so. Jack Kirby’s granddaughter Tracy Kirby appeared on Antiques Roadshow tonight, showing off some of her grandfather’s artwork. Check out the 2-minute video HERE. This entry was posted in TNT on 7 February 2011 by Mr. Morrow. It’s hard to believe it’s been about a year since our last Modern Masters book (on Guy Davis) shipped. But good old Eric Nolen-Weathington hasn’t been sitting around twiddlin’ his thumbs. He’s just been turning out acclaimed books on Sal Buscema, Carmine Infantino, and others (and hard at work on several you’ll see listed in our upcoming new catalog). 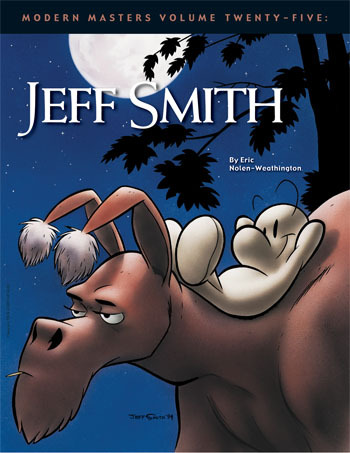 The much anticipated Modern Masters book on JEFF SMITH (I hear he created some kinda comic about a bone or something) will be shipping finally on March 2, and we’ve got a preview of it available now in both PDF and FLASH format at THIS LINK. Check it out, and order a copy. This is one awfully good MM volume; perhaps the best Eric’s ever produced (and that’s saying something!). Just a few more days, and we’ll have the digital version of our new catalog available for downloading! In the meantime, you can go to our homepage and scroll down to see a lot of the new stuff that’ll be in it. The printed copies will be shipping in about 4 weeks.